U.S. Rep. Paul Ryan was named to be the vice presidential running mate for GOP Presidential Nominee, Governor Mitt Romney. Ryan, the 1st District Wisconsin congressman, has carved a name for himself as a “budget hawk,” proposing a radical alteration in the US Budget that would cut entitlement programs to dramatically low levels. 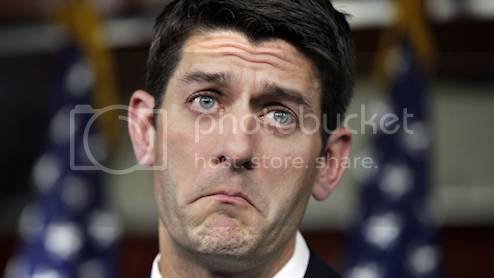 But ‘Paul Ryan Budget Guy’ is only part of the story of who Rep. Ryan really is. The other side of him shows a man who welcomes conservative views, even to the point of racism, but shouts down anyone who dissents with that point of view. As you can see and hear in the video, Ryan said “I agree..” Mitt Romney’s VP selection never stopped to say that he did not agree with the use of the term “anchor babies” or the overall racist tone of what the man said – who himself admitted that it would sound racist. But when the woman in the video responded with disgust over what the ex-Marine said, Ryan jumped to his defense and shut her down. Here, Ryan defended the man’s “right to speak,” but failed to defend the woman’s right to speak up against the man’s racist take on the illegal immigration problem. Ryan even said the term “anchor babies” himself – he says, reading his notes (see 4:46 time mark in the video) – and never once catches himself to correct his speech. ..in August of 2006, Chicago Tribune columnist Eric Zorn received two complaints from readers after he called for the arrest and deportation of a woman holding sanctuary in a Chicago church. Zorn referred to her child as an “anchor baby.” Zorn argued that the term had appeared in newspaper stories since 1997 “usually softened by quotations as in my column.” He said in a subsequent column that he regretted his use of the phrase and promised not to use it again. And overall, the evidence shows that the term is borne more of racism than any basis in fact at all. Those who comes over to the United States from Mexico, regardless of how they get here, come to work – some happen to have kids. But there’s no glaring evidence that any one comes over with the purpose of having a child just to get health care aide or any other kind of assistance. Still, those facts don’t stop anyone who wants to be what this blogger calls a “couch potato conservative” from not only using the term, but insisting that saying “anchor babies” isn’t racist, when it is. Ryan used it in the video without even catching a breath. Paul Ryan has shown a pattern of either shouting down, or in one case just outright arresting, dissenters. He did that September 7, 2011, when he was a guest at a luncheon of the Whitnall Park Rotary Club at Klemmer’s Banquent Hall in Greenfield, Wisconsin. Ryan also faced a negative audience at Whitnall High School in April. His pattern has been to either shout down, avoid, or arrest anyone who wants to share a differing point of view. But he has no problem giving platform to a racist one, and even using a racist term. This is the man Mitt Romney picked to be his vice presidential running mate. Be the first to comment on "Paul Ryan: Mitt Romney’s VP Pick Used Racist ‘Anchor Babies’ Term In 2011"